Our experience gives us insight into the operability, sustainability and affordability of chemical manufacturing while our diverse workforce creatively applies proven skills to scale and pilot programs.In reference to chemical reactors, as the core of a process, there is no “golden” rule and no straightforward procedure to achieve new product or process objectives. 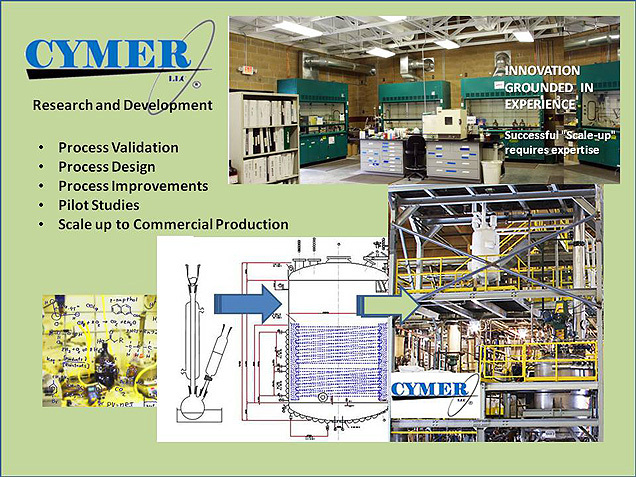 Cymer can test the technologies that will be used on an industrial scale, which may deviate from ones employed in the laboratory, in order to point out those phenomena not present on the laboratory-scale.Scale-up and pilot programs detect and balance the process for different apparatuses, different phases, impurities, aging of catalysts, corrosion, fouling, safety and environmental aspects. Cymer is uniquely positioned having pilot scale equipment 50 to 100 gallons scale as well as larger commercial scale equipment from 1000 to 3000 gallon scale. Cymer is able to make drum quantities for customer trials and well as millions of pounds commercial production.